IRS Gets Spending Bill Smackdown From Congress : It's All Politics In response to a 2013 scandal, lawmakers are pushing overall IRS funding to a five-year low and ordering the agency to obey the Constitution. The IRS is getting a special $200,000 earmark in the 2014 spending bill now moving through Congress. But it's not because the agency is suddenly in the good graces of lawmakers. The new funds are earmarked for "intensive training" in the Exempt Organizations division – the office that pulled the IRS into its worst scandal in years. Last spring, Exempt Organizations chief Lois Lerner apologized for the division's targeting of tea party and other conservative groups that were seeking tax exemptions as 501c4 social welfare organizations. Lawmakers are, in fact, giving the lash to the tax agency, pushing overall funding to a five-year low and instructing it to obey the Constitution. The IRS is ordered not to spend money to target citizens for exercising their First Amendment rights, or to target groups based on their ideological beliefs. It's all blowback from the 2013 scandal, which cost Lerner her job and led the White House to clean out the agency leadership. Lawyers for conservative groups say many of their clients have waited months, or years, for the IRS to approve their applications as 501c4 organizations. They say the agency subjected them to intrusive questioning beyond what's called for in the approval process. Liberal groups have said they also suffered delays in getting tax-exempt status. But none of them has called their own experience abusive. Some critics of the IRS blame the long delays on budget and staffing issues that the spending bill ignores. The National Taxpayer Advocate, an agency watchdog, says tax-exempt applications have tripled since 2010. Advocate Nina Olson says the Exempt Organizations division was already understaffed, but its budget was not increased. The result: More than a year's worth of applications now clog the system, with an 18-month wait even to begin processing. 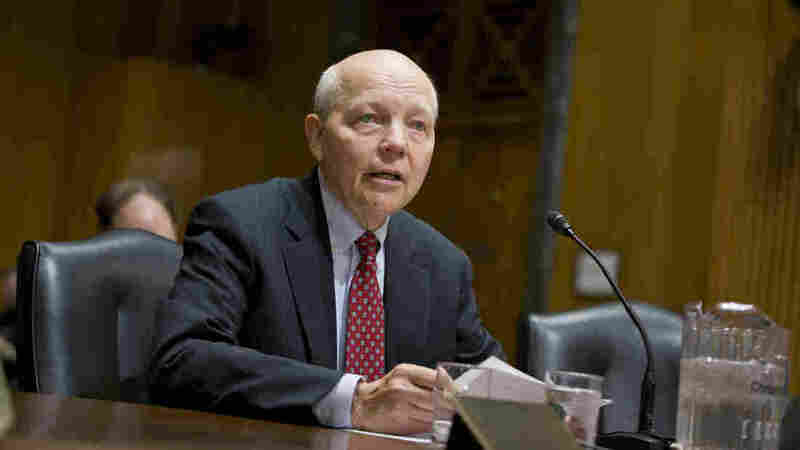 Several investigations of the IRS are under way. The Wall Street Journal reported Tuesday that an FBI probe likely won't result in criminal prosecutions. Oversight & Government Reform Committee chair Darrell Issa, R-Calif., and subcommittee chair Jim Jordan, R-Ohio, denounced the "apparently politically motivated" leak to the paper, saying it undermined previous statements from the FBI. James Comey, the FBI director, told reporters last week, "It's an investigation that we're still working, and that's an important one to us."